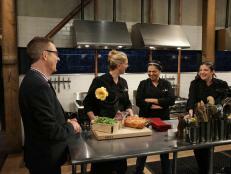 Catch an all-new episode of Chopped After Hours, where the judges cook with mystery basket ingredients from the show. Chris, Geoffrey and Alex trick-or-treat for a special Halloween dessert. 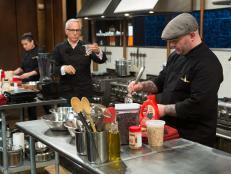 Things are always a little scary in the Chopped kitchen, but judges Chris Santos, Alex Guarnaschelli and Geoffrey Zakarian had the challenge of making it even more terrifying this week. After a special Halloween episode, they took on the spooky dessert basket filled with Day of the Dead cookies, a boo-nilla shake, chocolate-covered bugs and a watermelon brain for an all-new Chopped After Hours. Alex quickly noticed that the basket ingredients would need some work, pointing out that the icing on the cookies was just powdered sugar, food coloring and water. "Deceptively brilliant in color and extremely light on flavor," she said. 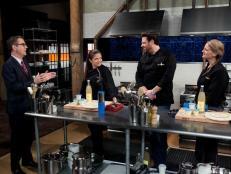 All three judges opted for the watermelon as their main flavor-enhancer, using it in three frozen variations. Geoffrey also added slices right to his plate as Ted worried it's too simple. "It's going to stay that way," Geoffrey said. "What I'm doing is so out there, it's beyond me, even." 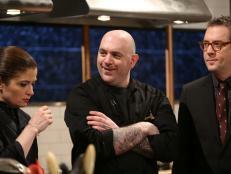 With a few minutes to go, Chris enlisted the help of the other guys in the kitchen. Ted helped by grabbing some bourbon. "I'm not going to cook with it; I just want some bourbon," Chris joked. The drink did make it into part of his dessert — a milkshake that Geoffrey helped create. "It's not really getting as thick as I'd like," Chris said. "Probably because I put Geoffrey in charge of it." Click the play button on the video above to watch the entire After Hours episode and see the dishes Chris, Alex and Geoffrey created. 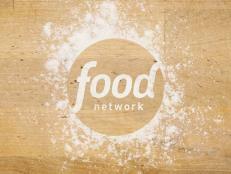 Then browse behind-the-scenes images for an insider's look at the cooking. Start a conversation with fellow fans and tell FN Dish in the comments below how you would have approached this basket: What would you make out of Day of the Dead cookies, a boo-nilla shake, chocolate covered bugs and a watermelon brain? 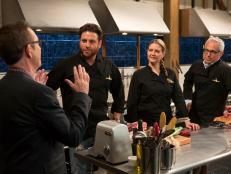 Catch up on past Chopped After Hours episodes by watching all of the Web-exclusive battles online. 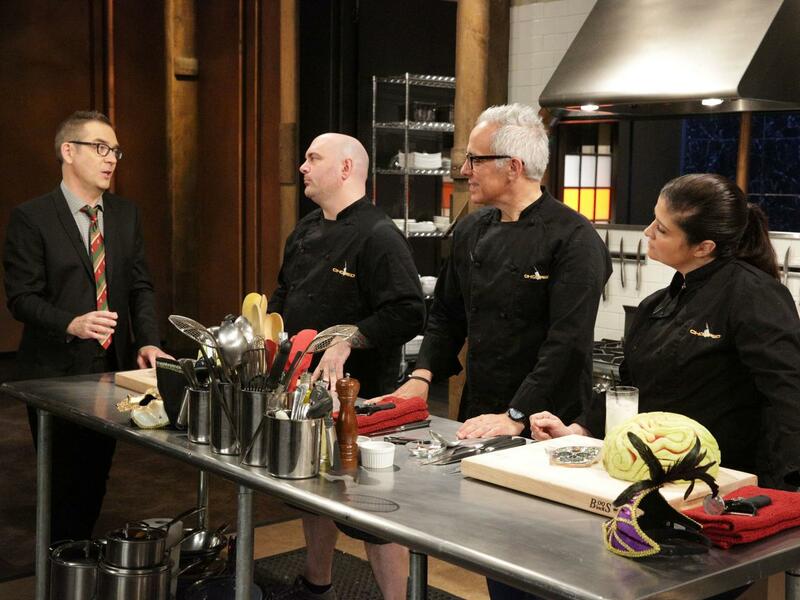 Watch the ninth battle of Food Network's Chopped After Hours to see the judges face off with the same mystery basket ingredients from the show. 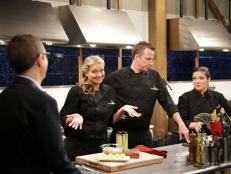 Find out what judges Amanda, Marcus and Scott make out of sausage and meatballs, chayote squash, tomato sorbet, and pasta dough. Watch the fifth battle of Food Network's Chopped After Hours to see the judges face off with the same mystery basket ingredients from the show. 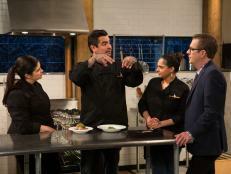 Watch the latest episode of Chopped After Hours, when judges Alex, Geoffrey and Chris cook the dessert baskets from the Short Order Cooks episode. Faced with the ingredients lamb shanks, fresh ginger, baby leeks and one outlier, creme brulee, the Chopped judges have 30 minutes to make a meatball dish on After Hours.